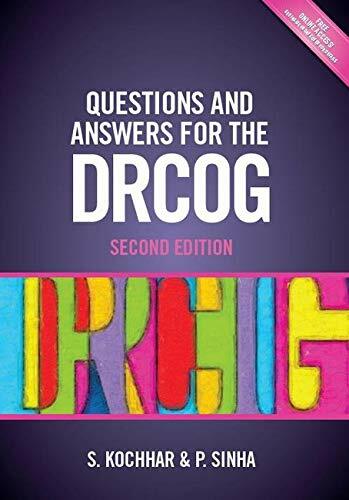 Questions and Answers for the DRCOG, second edition, is a comprehensive revision guide for candidates preparing for the DRCOG exams. Based on the format of the exam, the book features 120 EMQs, 72 SBAs and 160 MCQs; this is the equivalent of 4 full DRCOG exams. This book helps candidates prepare for the DRCOG exam. The new edition now features four complete papers matching the style of the current exam, with each paper comprising: * 30 extended matching questions * 18 single best answer questions * 40 multiple choice questions Importantly, detailed explanations are given for each answer to improve understanding and references are provided to guide readers to the supporting evidence. Written by a practising GP and a consultant in obstetrics and gynaecology who has previously examined for the DRCOG, this book provides the ideal revision guide for exam candidates. REVIEWS OF THE FIRST EDITION "Questions are very much like the real exam, and the answers are very precise. I felt prepared for the exam after going through it. In my opinion, possibly the best preparatory book in the market currently." "An essential book to prepare for the DRCOG examination with lots of questions and detailed explanations to aid revision, highly recommended!" "Having studied for this exam recently I found this book incredibly helpful and better than other revision guides that I have used. The format is clear with concise explanations for all questions. A highly recommended resource for the DRCOG exam." "Easy to use, great for motivating you to revise. Would recommend this to anyone planning to sit the DRCOG." "An outstanding revision guide containing a broad range of questions appropriate to this exam. Informative yet concise answers make this book stand out. An excellent preparation for the DRCOG."